International Airlines Group is seeking to gain a foothold on Austrian soil by using LEVEL, its low-cost weapon on transatlantic routes, to enter the crowded European short-haul leisure market. International Airlines Group (IAG) has never been slow to act when it comes to its long-haul low-cost brand LEVEL. 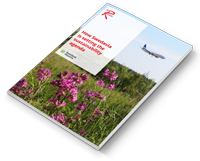 The airline’s first commercial flight took place less than three months after details of the carrier emerged, with IAG chief executive Willie Walsh telling World Routes 2017 delegates that the launch came “a year earlier than planned”. Now, the group has taken many by surprise again by announcing that LEVEL is to move into the short-haul market - and its maiden flight will take place in just three weeks. LEVEL will base four 210-seat Airbus A321 aircraft in Austria’s capital Vienna, from where it will fly to 14 European destinations. On 17 July 2018, services will begin to Palma de Mallorca and London Gatwick. Over the subsequent four weeks, flights will take off to Barcelona, Malaga, Venice, Olbia, Ibiza, Paris Charles de Gaulle, Milan Malpensa, Dubrovnik, Larnaca, Alicante, Valencia and Bilbao. 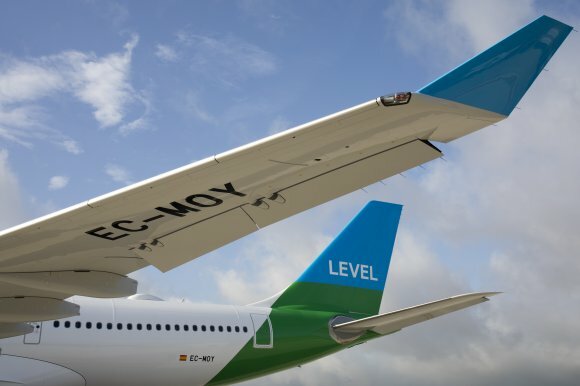 LEVEL began transatlantic flights from Barcelona El Prat in June 2017 and will next month open its second base at Paris Orly, flying to Montreal, New York Newark, Guadeloupe and Martinique. The brand will replace its OpenSkies division in Paris, with all staff transferring across. To operate the flights from Vienna, the British Airways-owner has set up a new Austrian subsidiary called Anisec Luftfahrt GmbH with an Austrian Air Operator’s Certificate (AOC). The group originally advertised for pilots and crew under the ‘Vueling Austria’ name, but now appears to have decided the LEVEL brand will lead its assault on the Austrian market. The move comes weeks after Norwegian rejected two separate takeover offers from IAG and six months after the group failed in its bid to purchase the assets of Niki, the Austrian airline founded by motor racing world champion Niki Lauda that was previously owned by Air Berlin. IAG originally agreed to pay €20m to acquire the insolvent carrier and up to 15 Airbus A320 aircraft, as well as “an attractive slot portfolio” at various airports including Vienna, Dusseldorf, Munich, Palma and Zurich. It hoped the purchase would help it bolster the presence of low-cost subsidiary Vueling. However, following a change in the insolvency process, IAG eventually lost out to Lauda’s Laudamotion, which has since secured investment from Ryanair. Under the terms of that deal, Ryanair has taken a 24.9 percent in the fledgling carrier, which will increase to 75 percent subject to approval by EU competition regulators. Had IAG been successful, it would have given it an immediate presence in Austria, Germany and Switzerland, all Star Alliance strong holds. 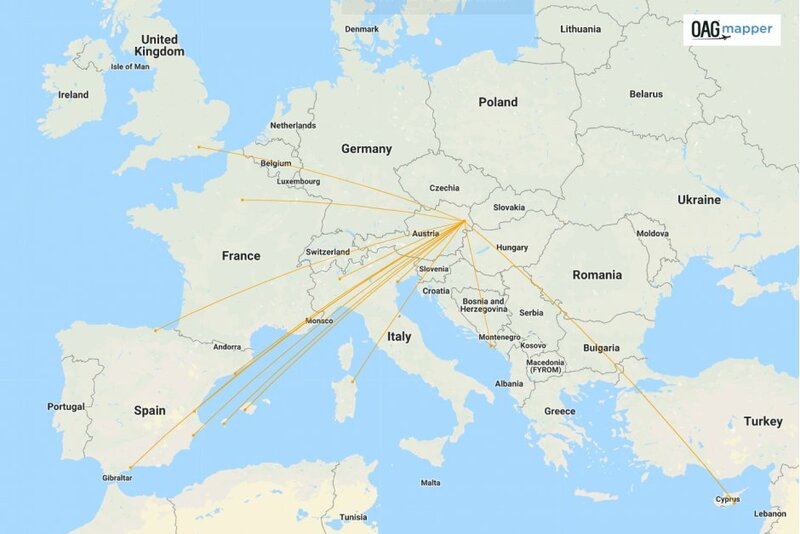 Integrating the network into Vueling would have also enabled the group to defend its Zurich-Spanish market and build a greater presence in Austria and Germany, where its market share to Spain is relatively small. Despite the setback, IAG will be hoping to steal a march on Laudamotion by opening its Vienna base three months before the Ryanair-backed carrier launches 20 routes from the city in October. The new bases come at time of stellar growth for air traffic at Vienna, helped by the growth of Austrian Airlines, Eurowings and easyJet from the airport. It handled 24.4 million passengers in 2017, a 4.5 percent year-on-year increase, despite the collapse of NIKI and Air Berlin during the year. The two airlines had been its second and third largest by capacity share in 2016, according to OAG Schedules Analyser. Since the turn of the year, Wizz Air has opened a base with an Airbus A320 aircraft and launched services to Rome Fiumicino, Malta, Bari and Tel Aviv. Other new routes include SAUDIA’s flights to Riyadh and Jeddah and Air Arabia to Marrakech. Latest figures published by the airport show passenger growth of 4.9 percent from January - May 2018.